The third annual Write Michigan Short Story Contest, the competition that drew nearly 900 Michigan writers in its second year, is back. The contest is presented by the Kent District Library, Schuler Books and Music, and Herrick District Library. Stories can be submitted at www.writemichigan.org through November 30. Writers of all ages can enter, with separate categories for Youth (11 and under), Teens (12-17) and Adults (18 and up). Details include a 3,000-word maximum length; $10 entry fee for ages 18 and above, free for 17 and under; Michigan residents only; all entries must be submitted online. Winners are chosen by public vote for the Readers’ Choice award and by a panel of judges for the Judges’ Choice award. Voters and judges choose winners from the top ten semi-finalists. The top honor in each category receives a $250 cash prize. Winning entries will also be published by Chapbook Press. Winners will be honored during an Awards Ceremony taking place on Saturday, March 21 at Schuler Books & Music. Susan Dennard, author of the young adult Something Strange and Deadly series, will present the keynote. 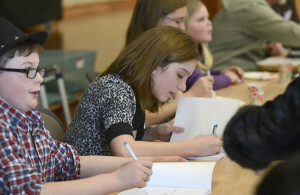 Participating libraries are offering writing workshops for adults, teens and children. Details can be found at www.writemichigan.org/events.html. For more information, visit www.writemichigan.org.